“Did you know? In 1833, Britain used £20 million, 40% of its national budget, to buy freedom for all slaves in the Empire. The amount of money borrowed for the Slavery Abolition Act was so large that it wasn’t paid off until 2015. 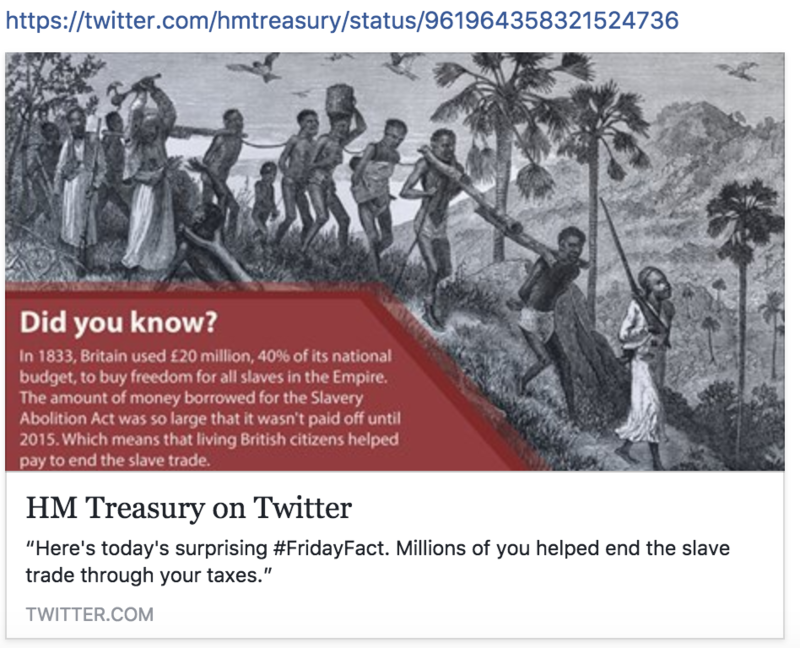 Which means that living British Citizens helped pay to end the slave trade.” @hmtreasury This tweet was posted on Friday 9th February 2018, and deleted overnight on Saturday 10th February 2018. HM Treasury quickly re-thought their position on sharing this data. In a rapid backtrack the government department of HM Treasury appears to have decided that they were not, in fact, ready to open the debate on the colonial legacy that is the backbone of the British country. There has been a continual thread of unease and sensitivity about the role of the British Government and the British aristocracy in the slave trade. The 1833 Slavery Abolition Act was not the end of slavery, merely the means to introduce a way to end the abominable trade in enslaved human beings. Historical records released in 2013 showed that some of the compensation paid to thousands of wealthy aristocratic families for the loss of their “property” was utilised to buy, build and refurbish many of the greatest properties currently found in the British countryside. The searchable database at University College London http://www.ucl.ac.uk/lbs/ holds information on the estates and plantations in the British Caribbean and also traces ‘the impact of slave-ownership on the formation of modern Britain’. The #FridayFact tweet from @hmtreasury highlighted that £20 million of public money was paid as ‘compensation’ to ensure abolition. This was being paid by British Citizens until 2015. (£20 billion in current value.) Therefore this means descendants of enslaved people, amongst others, have been contributing to the wealth of those who enslaved their forebearers. No reason has currently be given for the removal of the tweet, however it is not unreasonable to suggest that it was probably removed due to embarrassment following negative feedback of the ‘celebratory’ tweet. Even with the recent revelation that the first Brit, aka ‘Cheddar Man’ had dark to black skin pigmentation, blue eyes, and dark coloured curly hair, the overall audience of ‘celebratory’ tweets like this one is aimed at the group of people with lighter pigmentation, that is now considered to be the defining feature of inhabitants of the northern section of Europe and America. I have to wonder if the impending marriage of Meghan Markle to Prince Harry on the 19th May 2018 will encourage the press to reflect before tweeting and commenting with impunity or if this union is another reason for the increase in insensitivity of Government officials and press worldwide, as evidenced in the recent tweet of the Wisconsin’s Republican candidate for Congress. As a British born descendant of Caribbean immigrants (with West African ancestors) I am incensed at the insensitivity of the original tweet as I have been a tax payer since 1977, and my parents were tax payers from the time of their arrival in the UK in the late 1950s, and have unknowingly contributed to the wealth of the oppressors of my own family and generations of ancestors. This perverse fact cannot be a cause of celebration for anyone with a similar ancestry to my own. This tweet is an affront to all BAME people in the UK, not just those with a Caribbean history. Growing up as a minority in the UK racism was an always present, sad part of life. This incident shows that the history and sensibilities of the whole of the British population has not been considered before this tweet was shared. Black History Month does not just take place two months a year (February and October in some countries), it is a fact of life every day of the year for BAME people who are an integral part of British life, because we are British, and Black. We are not an enigma and it’s about time the Government realised this. This tweet and the sharing of information about British taxpayers’ contributions to ‘end slavery’ is indicative of the overall tone of the incumbent hard right-wing Conservative Government who generally disregards and ignores the daily realities of people who are as British as the majority of them are, yet who largely remain invisible in thought and policy decisions because of their Empire origins. The tweet, reflect, delete situation from HM Treasury is a perfect example of the depth of misunderstanding relating to the impact, legacy and the intersectionality of discussions on the subjects of colonialism, racism, reparations and slavery. It is evidence that the perspective of marginalised citizens were not considered. This tweet was exclusive and offensive and the contemporary and historical nuance of it can be difficult for people to understand without considering the links of history that have created and contributed to the forced worldwide migration of millions of people.